Great Do-It-For-Me Options — With no setup fee and no long-term commitment, Web.com can build your website for you, saving you time and stress. Limited Free Functionality — Web.com does not offer a free trial period, and the free website builder option comes with serious strings attached. Tons of Templates — There are more than 2,500 different designs in Web.com template gallery, giving you a variety of options to choose from. In short, the “Do It For Me” service is robust and will allow you to get exactly the site you want, without having to do much on your end. But most reviews of Web.com agree that the Web.com DIY process takes more time, effort, and patience than many other modern builders require. How much is Web.com? Web.com pricing for the DIY builder actually starts out affordable and competitive, but then skyrockets to ridiculous rates after 30 days. 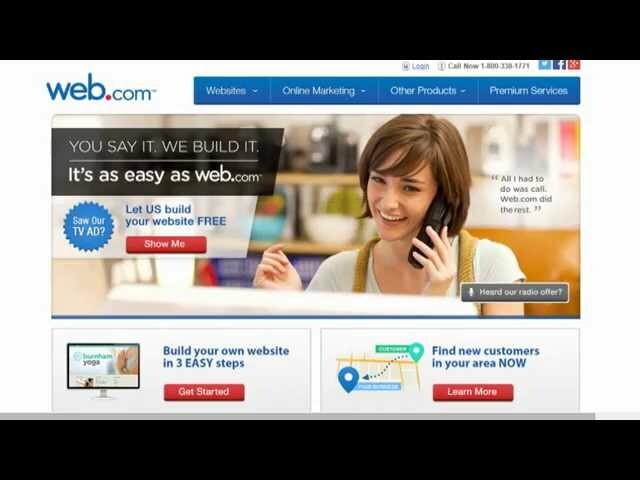 For example, the introductory Web.com cost for using the website builder starts at just $1.95. But four weeks later, the rate jumps to $22.95 per month. That’s much higher than what more modern and feature-rich Web builders charge for similar plans and better software. This could explain all of the Web.com reviews with complaints. Although Web.com introduced support for mobile websites in 2013, mobile responsiveness isn’t exactly one of the builder’s strong suits. As opposed to more advanced platforms, Web.com mobile websites aren’t dynamically resized versions of existing sites, optimized for smaller screens. Instead, they are completely separate sites that require their own maintenance, and that come with their own price tag. Web.com stores allow users to accept payments from every major credit card company, plus other services including PayPal. The platform also gave me the option to choose a payment processor in case I didn’t already have one. This Web.com ecommerce review wouldn’t be complete, though, without mentioning that the out-of-the-box experience doesn’t include a mobile-friendly version of ecommerce stores, or the added security of SSL protection. Web.com’s ecommerce solutions are surprisingly robust. Aside from adding products and managing orders, you can keep track of your customers and send them marketing messages. Web.com also provides users with comprehensive reports, and makes it easy to search for customers, orders, and products. There are also a bunch of other available features including the ability to create coupon codes, customer blacklists, and tracking codes for online advertisements. Essential hosting on Web.com includes 300 gigabytes of storage and allows for 100 multiuser email addresses. Professional Web.com web hosting offers 500 gigabytes and the same number of email addresses. Premium Web.com hosting services lets users store an unlimited amount of data, and have up to 1,000 email addresses on their account. The DIY version of the Web.com builder can be used to create a decent-looking site to suit your needs, but has many limitations. We’d recommend the “Do It For Me” service instead to ensure you’ll get the best Web.com features and functionality. So, as for my Web.com website builder review, I’d suggest going with the custom-built site by the experts if you choose this provider.